3 DAYS OF COURTROOM DRAMA IS COMING TO ONTARIO’S DURHAM REGIONAL COURTHOUSE AND YOU ARE INVITED. 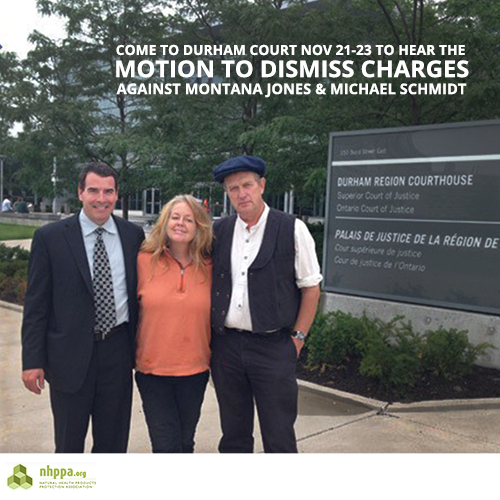 A motion to dismiss the 2012 “sheep napping” charges against Montana Jones and Michael Schmidt will be heard from November 21 – 23, 2016. All are welcome and encouraged to attend. In this case, as with many others, lives and freedom are at stake. Having you present accents the importance of the case. Court starts at 10 am sharp. Arrive early! The Supreme Court of Canada recently established that criminal matters should be heard within 30 months or less. Timely trials are important for accused, victims and society as a whole. It’s easy to imagine witnesses’ memory fading within months or evidence being lost over time. Justice cannot be served when evidence has degraded too much. In this case, many Crown witnesses could not answer questions for lack of memory at the preliminary hearing, over two years after the charges. Montana and Michael will have waited almost four and half years by the end of the anticipated trial in 2017. This is almost two years beyond the 30-month presumptive delay period. Part of what Geneviève Eliany, legal counsel at Buckley & Company, will be arguing is that Crown’s application to remove counsel Shawn Buckley for a conflict of interest was frivolous and without foundation. This case’s conflict proceedings dragged on for a year and a half. Eliany will also be arguing that late disclosure caused two adjournments of the preliminary hearing. The Crown, on the other hand, blames defence for requesting irrelevant disclosure and claims it fulfilled its duty to raise a possible conflict of interest because Shawn Buckley represented two co-accused.